Rats love to climb all over parrot toys and chew them up. Most parrot toys are safe and enjoyable for rats. If you have any old cardboard tubes or toilet paper tubes lying around, gibe them to your rats. They'll have a blast climbing through them, sleeping in them,and chewing them. Rats need to gnaw on things to keep their teeth short. Providing them with wood gnaws or other wood chew toys from pet stores is a good idea. 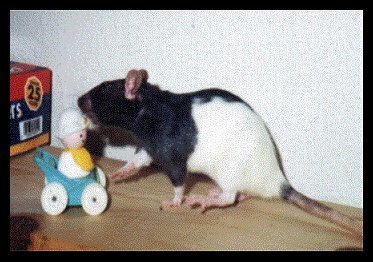 A rat ball is a common toy that most rats love. But there are some rats that don't enjoy them, so be careful when introducing a rat ball to your rat.